The entire caravan consisted of Pepper Domo and an iron carriage pulled by a green-skinned tiger. Svetlana had spent the night comfortably in one of Domo’s guest rooms. She said goodbye to Gehosopha over breakfast. Domo had yet to show himself when the hyep departed. Perhaps the Apothecary had drank too much Andromedan last night and required more recovery time than the Composite Being, who could spread a hangover across several brains at once. Svetlana was eager to begin the next leg of her journey, but only Domo knew the way. “Can I trust this Apothecary?” she asked Gehosopha as he left. She had no idea how to approach embracing the cluster of heads that was Gehosopha’s middle body, so she simply nodded and offered him an awkward bow. Svetlana wanted to weep, but she took a deep breath and saved it for later. She waved as the Composite Beings lumbered down the street, the tops of their central stems loaded with crates full of fresh serums. The bizarre crowd soon swallowed them up. Domo’s carriage came rolling from the stable behind his shop. The body and four wheels were made of black iron, the roof lined with a short fence for securing luggage and trade goods. A silver trim formed arabesques across the single entry door. A curtained window on the opposite side of the coach showed drapes of red velvet. The barrels and trunks containing Domo’s serums had been loaded onto the top of the vehicle, tied into an impressive pyramid by a net of strong ropes. The tiger’s meaty shoulders stood level with Svetlana’s chin. Its fur smelled like wild grass in summer, and she longed to run her hand through it. She resisted the urge as it turned to sniff at her, showing its magnificent fangs. She heard a rumble deep in its mammoth chest, and its big pink tongue licked at her boots. The servant who had brought the carriage around leaped off the driver’s bench and ran back to the stables. Svetlana had arrived early in the yard with satchel, cloak, sword, and pistol. Ready to go at sunrise, as requested. She stood before Domo’s waiting carriage awhile. Apothecaries and their wavy-eyed servants rushed up and down the streets, but it was too early for much customer traffic. Both suns were up and the heat was rising fast. For a moment she considered climbing into the driver’s seat of the carriage and taking off without Domo. If she had any idea where to go, how to find Creep City on her own, she might have done it. Instead she crossed her arms and leaned against the side of the shop. The tiger took her cue and lay itself before the carriage, crossing its front paws and resting its chin. The traces that bound it to the coach were polished leather hung with silk and jewels. “You must be the new muscle.” A deep voice from the other side of the carriage. Two large, booted feet were visible. The coach hid the rest of whoever stood there. Svetlana moved behind the vehicle to get a look at the new arrival, but she found nobody standing there. Behind her. She whirled and something darted from her line of vision. It was inhumanly fast. She reached for Takamoto’s sword and cursed. The handle wasn’t there above her shoulder-blade where it should be. The scabbard was empty. “Looking for this?” She turned. The gleam of Takamoto’s steel she recognized immediately. The figure holding it took awhile longer. One of the reptoids that served as the guardsmen of Nil leaned against the doorjamb precisely where she had been standing seconds earlier. His scaled body was covered by form-fitting silvery armor, mostly along the limbs and midsection. Svetlana identified seven points of weakness in that first half-second: ankles, knees, wrists, elbows, underarms, groin, and neck. None of those areas was covered by the silver metal, but each spot did have dense and scaly skin to protect it. Then there was his head, handsome in its own grand ugliness. A twin set of bone ridges lined the top of his skull. A pair of vertically slitted eyes gleamed yellow above a sloping snout that ended with flared nostrils. The reptoid’s fangs were miniature versions of the tiger’s, but his toothy grin was altogether human. A forked tongue darted in and out between the fangs. His scales were an uneven blend of green and black, or perhaps they were of a green so dark that it resembled black. A pistol hung at the lizard-man’s side, and a rifle lay across his back. Neither of his weapons looked like those of Svetlana’s world, but their shapes were unmistakable. Her own pistol was made of dark metal, but the reptoid’s gear was polished silver like his armor. She took all of this in while the reptoid stared at her and twirled Takamoto’s sword, taunting her like a child who had stolen a toy. “I don’t need that sword to kill you,” Svetlana said. The reptilian smile widened. “You didn’t even know I was here,” he said. “You’ll have to be more alert if you’re going to work for Domo.” He reversed the sword, offering her the grip while the blade lay naked in his palms. It could have been a dare to use it against him. If it was, she didn’t take the bait. “Who are you?” she asked, sheathing Takamoto’s blade. “You’ll have to ask him yourself,” Svetlana said. She turned away from Bruno and put her back against the wall again. How much longer would Domo keep her waiting? When she opened them, Bruno had backed away. He inspected the ropes that tied the baggage onto the coach roof. Men had tried to bait her before, and she had learned to ignore it. Once they saw her skill at the hunt or in defense of the community, they gave her respect. This is how warriors bonded. If she was going to travel with Domo, she would have to establish a warrior’s bond with the lizard. Unless the customs of his own society prevented such a thing. Then she would have to make the entire journey enduring the heat of his scorn. She might have to kill Bruno if it came to that. A hundred such lizard-men would not keep her from finding Dima. She waited and kept her mouth shut. Bruno took his spot on the padded driver’s bench, and the tiger woke from its nap yawning. Pepper Domo appeared in a cloud of powder, perfume, and flying silks. The front door of his shop burst open at the hands of two servants, and he swept through it in a robe of nine colors and carrying a scepter of gleaming glass. Whenever he took a step the air was filled with the tinkling of glass vials like tiny bells. His eyes at the end of their stalks blinked at the brightness of morning. Spreading his arms wide, staring at his carriage fully prepared and the two bodyguards awaiting his pleasure, Domo sang in a high voice. The servants kneeled about him in reverence. The tiger purred like a great engine. Domo finished his song and the servants withdrew. The Apothecary turned his eyes to Svetlana and smiled with his sideways mouth. It’s here! WEIRDBOOK Annual #2 is available at last. A massive tome of all-new weird fiction—and poetry—all inspired by H.P. Lovecraft’s Cthulhu Mythos. A diverse assortment of eldritch horrors and terrors from beyond awaits the intrepid reader. FORBIDDEN FUTURES is a unique celebration of dark fantasy art and storytelling. The third issue features a “high fantasy” theme, but don’t expect the traditional fantasy fare as weirdness and horror are more likely to show up than “sweetness and light” in these adventures. All the stories are based on artwork by the sensational Mike Dubisch, and the esteemed Cody Goodfellow serves as contributing editor. My story “Tears of the Elohim” appears in this issue, alongside one of Mike’s many superb illustrations. You won’t find another magazine like this out there, blending voices of fantasy and horror prose with fantastic artwork from a single illustrator’s visionary palette. I will not be writing a third TALL EAGLE novel this summer. Instead, I’m going to focus on writing a new batch of short stories for various markets. To explain the staggering irony of this decision, a little background: This year I’ve written more short stories than any single year since 2012, when my first novel was published. So I’m kind of on a roll short-story wise. Sales of the TALL EAGLE books has not been what I’d call impressive. Reviews are all great, but reviews don’t sell books–regardless of what Amazon tells you. I’ll say it again: Reviews don’t sell books. Especially when those books aren’t being distributed to bookstores all over the world (my first trilogy WAS distributed to bookstores all over the world, so it actually sold a decent number of copies for a relatively unknown writer). This means there is no real demand for more TALL EAGLE books — at least not right now. I do hope that changes someday, because I’d love to write more about Ispiris and its strange wonders. Maybe the TE series will find its audience eventually, and at that point I’ll come back to it. But right now there is practically nobody waiting/expecting/demanding a third TALL EAGLE book. However, there is always a demand for good short stories. About ten years ago, I decided to quit writing short stories and focus on novels. 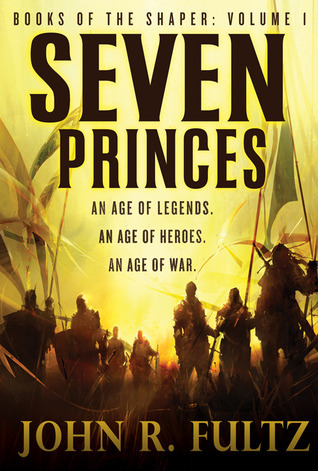 After two or three years I had produced my first novel, SEVEN PRINCES, which got me my first Big Writing Contract, and I turned that novel into a trilogy that I’m very proud of. It didn’t set the world on fire, but it did establish a firm fan base of people who really dig The Shaper Trilogy–a fan base that is still slowly expanding from year to year. I got into writing novels because I realized that nobody can build a writing career on short stories alone. Now, I’ve come full circle–hence the gigantic irony–I’m back to writing short stories because I can’t rely on novels to sustain my writing career. There’s not much demand for my novels–oh, a few people every month still discover the Shaper Trilogy or the TALL EAGLE books–but it’s nothing like a vast audience. 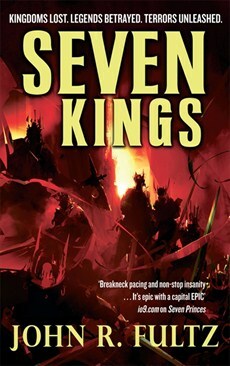 I’m just glad that all my novels are still in print and will be in print (and ebook format) for the forseeable future. That means that all five of my novels are just sitting there–online and offline–waiting for me to drive readers toward them. Every time I get a short story published, it gets exposure for my name and for my other work. Not every reader will enjoy a story and seek out a novel by that same author–but a lot of them do. I know I’ve always done that as a reader myself. 1) I get paid. Short stories don’t pay a whole lot–especially in the smaller and indie markets that dig my writing. But I get something in my pocket for all my hard work. That’s nice. 2) As long as I keep writing short stories, as long as I keep getting BETTER at it, there’s always a chance of cracking into a top market (i.e. a high-paying story market). 3) Every published story promotes my novels. The novels are the pillars that support my writing career. But the short stories are foundation stones–they helped me build up to writing novels–and now they help me promote and expose those novels to new readers. So I’m going to focus on writing short stories for awhile. Short stories that allow me to flex my creative muscles, to grow and experiment, to take various ideas for a ride and see where they lead me. Stories that promote my catalog of books simply by having my name on them. I’ve started the Magtone Saga already in WEIRDBOOK. This is a cycle of tales chronicling the exploits of a wandering poet-thief transfigured by sorcery. Magtone first appeared in the pages of WB #37. The second Magtone tale, “Clouds Like Memories, Words Like Stones” will be in WB #39–set for release sometime in the next few weeks. A third Magtone story called “Impervious to Reason, Oblivious to Fate” has been accepted for WB #42 (which will be the first issue of 2019). Although Magtone himself plays a key role in all of these stories, each tale introduces new characters, realms, and concepts, fleshing out a phantasmagorical world of magic and mystery. I’ve also written two new Cthulhu Mythos stories: One for Darrell Schweitzer’s forthcoming MOUNTAINS OF MADNESS REVEALED anthology, where global warming and climate change meet the eldritch horrors of H.P. Lovecraft’s classic — with a sci-fi twist. My contribution is called “The Embrace of Elder Things,” and it takes place mainly in a future moon colony that is the last bastion of human civilization. The other Lovecraftian story is “The Thing In The Pond“– a tale inspired by Clark Ashton Smith’s favorite Great Old One, Tsathoggua, also known as the Sleeper of N’kai. This one takes place in the early 20th Century Midwest, and it’s more of a psychological approach to cosmic horror. Scheduled to appear in the Mythos-themed WEIRDBOOK Annual #2 (Fall, 2018). I do plan to write more Magtone tales, until that story-cycle comes to its natural end. But I also enjoy the freedom to write stories about whatever I want. The most challenging thing about doing short stories is finding a (paying) publication for them. The trick is to keep writing them, and keep sending them out. Always have something in play. One editor’s “trash” is another editor’s “treasure.” It really is that subjective. I’m glad to have a few markets that are actually requesting stories from me. I hope to expand that list and get my stories into fresh new markets as well. Meanwhile, my novels aren’t going anywhere. It’s my job to bring the reading public’s attention to them. The best way to do that is to impress readers with short stories that make them want to seek out more of my work. In other words, it’s time to focus on short stories for a while. Instinct tells me that I will return to novels at some point. I love writing novels. But I don’t know when that will be, and I’m okay with it. Above all, a writer has to follow his or her inspiration, regardless of market trends or sales figures. I want to take this short-story momentum that I’ve built up this past year and kick it into overdrive this summer. My passion for short fiction has come back in a big way, so I plan to keep that fire burning. And at some point this summer, I hope to mix in some actual vacation-ing. The Audient Void #5 is now available. It features two stories by Yours Truly (“Oorg” and “Love in the Time of Dracula”) as well as a bunch of other great stuff—including a story and column by David Barker plus scads of weird poetry. Complete TOC below. Order your copy right here. It’s been out as an eBook since last December, but finally SON OF TALL EAGLE has arrived in a gorgeous paperback edition from Crossroad Press. Get your copy now–the Tall Eagle books can be read in any order. I plan to finish a third Tall Eagle book this summer in hopes of having it released before the end of the year. Meanwhile I’m working on a few short stories for various publications. THE AUDIENT VOID #5 will be out soon featuring TWO of my most eerie horror tales. A second Magtone Tale is coming in WEIRDBOOK #39. I’m also finishing up a new high fantasy tale for Cody Goodfellow’s lavishly illustrated FORBIDDEN FUTURES, which will debut at Crypticon Seattle (and will be available for online ordering). Looking forward to cranking out more stories and at least one novel this year, and I’ve made plans to attend the World Fantasy Convention in Baltimore this November. Poe City! The first review of SON OF TALL EAGLE is in!